Waltham`s pre DSO transmitting array. 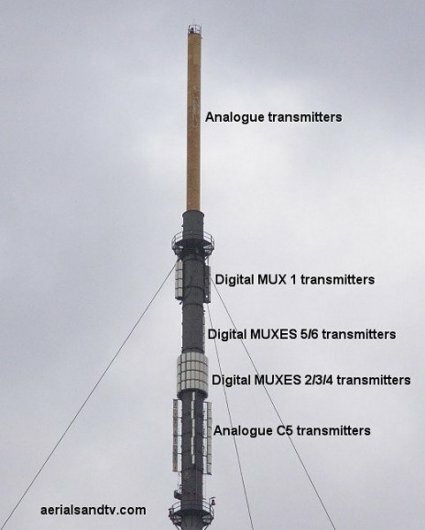 Note how the MUX 5/6 antennas were almost hidden on the NW face of the mast so as not to broadcast in the direction of Sandy (which is SSE), which would have caused co channel interference with Sandy`s pre DSO transmissions. Post switchover this isn`t a problem, so now Waltham`s transmissions are omnidirectional. 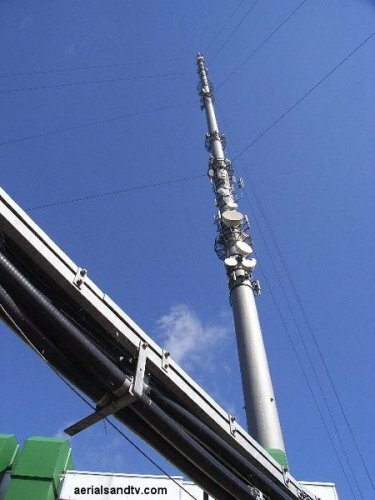 Picture showing the feeder cables which carry the Digital signals up to the transmitters. These feeders are about 6” in diameter and and over 300m long they are very expensive (tens of thousands of pounds each) and there are four of them, two each for the main transmitters and two for the reserve antennas. All the main constituent parts of any main transmitter are duplicated at (great cost one might add) so there is always a back up ready to use. Don`t forget these things provide TV pictures for huge numbers of people, around 1.5 million depend on Waltham. * Based on the BBC estimates from 1977, but I can`t imagine they`re that far out. The last time I looked all the major towns and cities were in the same place as they were in 1977.…. I think these figures are more accurate than the Ofcom quoted statistics which don`t seem to take into account of people in a transmitters reception area actually using a different transmitter. For instance, many people in Waltham`s reception area actually use Sutton Coldfield, or Belmont. 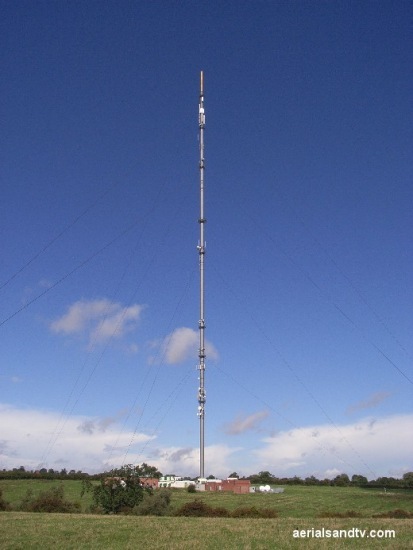 The guide below also includes the same data for some of the other major transmitters also receivable within Waltham`s coverage area, namely Sutton Coldfield, Oxford, Sandy, Tacolneston, Belmont, Emley, Chesterfield, Nottingham and Fenton. Also check Waltham`s sixteen (including Nottingham) smaller repeaters. Note that MUX 4 is out of the original C/D group of the transmitter. 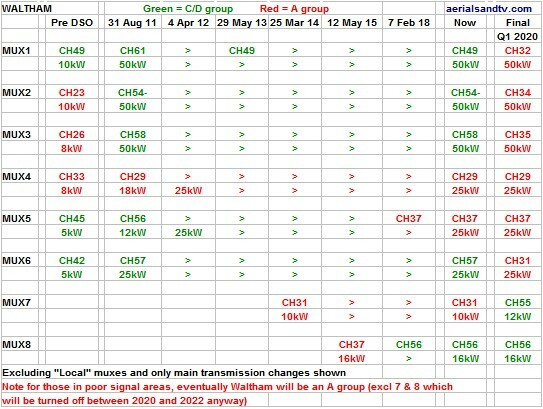 For Waltham`s frequencies see its channel allocation guide. Waltham television transmitter (TX) is a "guyed mast" structure 309m in height (see How High is High ?) and is situated 18 miles SE of Nottingham. The mast is identical to Mendip and Bilsdale. It was built by British Insulated Callender`s Cables (or B.I.C.C) who were responsible for much of the infrastructure built in this country from 1945 up to the 1980s. The company is still going but now called Balfour Beatty. The mast is a tubular structure to the top and has in internal lift, though this is out of use partly due to the accident at Belmont. The transmitter was originally owned by the BBC before being sold off to Crown Castle then to National Grid Wireless and finally to Arquiva (sic). Waltham was erected in 1968, or to be more accurate the present structure was put up then. The original fell down in 1967 just before entering service ! Waltham broadcasts ITV Central and the relevant BBC Regional TV programmes from the East Midlands. Its population coverage is around 1.5 million people and many in Nottingham, Leicester, Peterborough, Lincoln, Derby and Mansfield are aligned onto it. Being a main transmitter Waltham is horizontally polarised and puts out (up to) 50kW. Originally, for analogue, it was a C/D group but since the advent of digital television it is now a T group (or wideband). 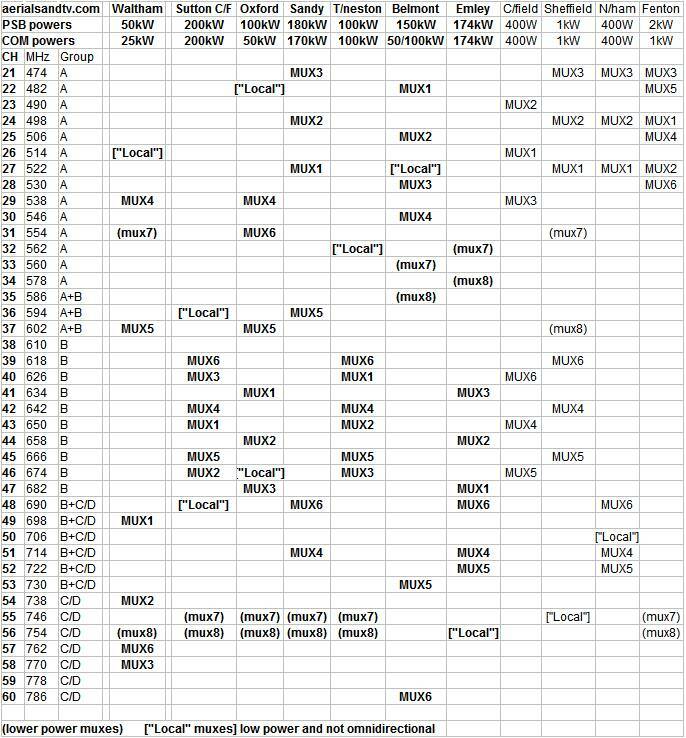 However, of the main six MUXES only MUX 4 is out of the original C/D group and even that may well be receivable in decent signal areas (although this is less likely to apply for some cheap crappy Contract aerials). See Waltham`s graph. There is one “Local” MUX allocated to Waltham, CH26, which is mainly used for a local Nottingham TV station. 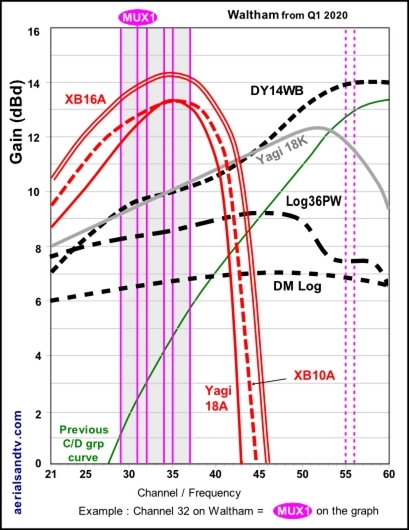 For Waltham we recommend the DM log for strong signal areas, the Log36 or Yagi 18K for medium signal areas, the DY14WB for poor signal areas, and the XB22WB for those with the most marginal signals. The dimensions and test performance of the aerials can be found on the relevant tables. If requiring a “high gain aerial” in the loft we recommend the DY14WB over the XB22 because of the former aerial`s smaller size. 700MHz clearance is due at Waltham in Q1 2020. It is due to change from a wideband / T grp to an A group on CHs 29 to 37 (excl MUXES 7 & 8). Most existing wideband / T group aerials should continue to work. 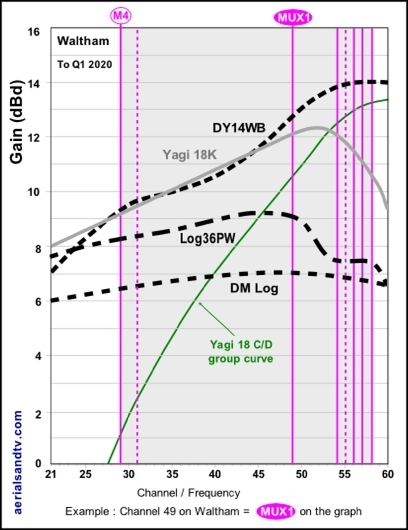 This graph illustrates clearly how, post 700MHz clearance, some aerials, mainly C/Ds (but also possibly the odd wideband) may struggle to pull in an adequate signal. The good news is that swapping to an A group aerial will actually put you in a better position than you were before (i.e. better than a wideband on a wideband Waltham). This is because, watt for watt (transmitted power), A group signals [being a lower frequency] travel further more efficiently than C/D signals. Provided, of course, you have an aerial tuned to pick them up at peak efficiency, i.e. an A group aerial !